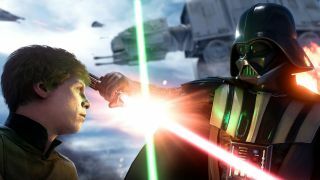 Several videos have emerged of invincible players in Star Wars Battlefront. No matter how much blaster fire they sustain, they simply won't die. Curious! It could be cheaters. They love online shooters. Or it could be a bug caused by some unknown circumstances. Or it could be that they've become one with the Force. Watch the videos and judge for yourself. That definitely isn't right. DICE haven't commented yet. Hopefully they're working on it for the next patch. Or maybe it's so rare that even they can't replicate it. Some people seem to think the bug is triggered if you crash an aircraft (like an X-wing or TIE fighter) just as the server lags. I've also seen images on Twitter of a walker vanishing in Walker Assault, making it impossible for the Rebels to win the match.